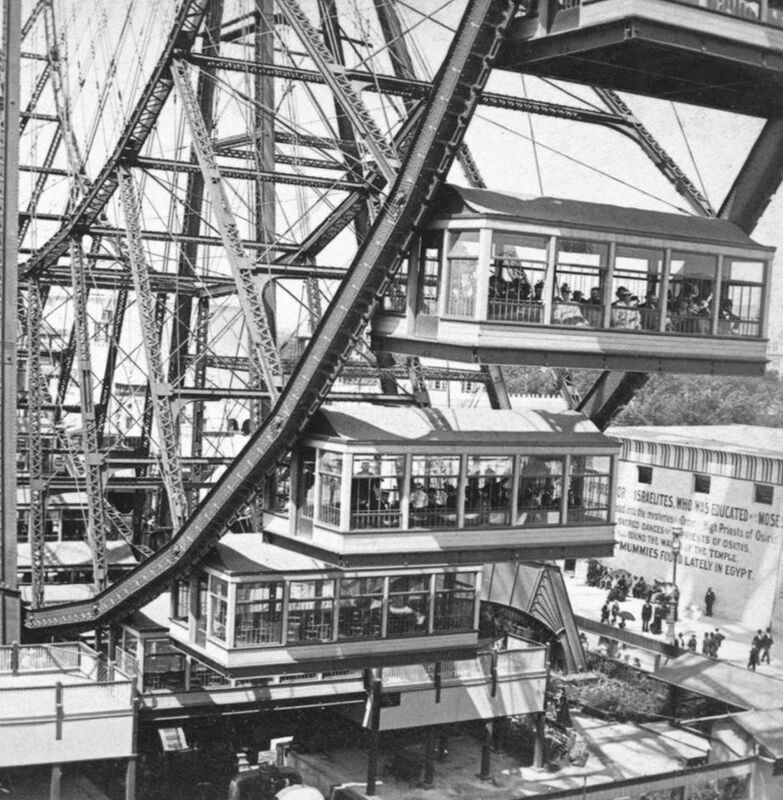 The Digital Research Library of Illinois History Journal™: The Eighth Wonder of the World: Ferris' Wheel at the Chicago 1893 World's Fair. The Eighth Wonder of the World: Ferris' Wheel at the Chicago 1893 World's Fair. The Ferris wheel at the Chicago 1893 World's Columbian Exposition was the most successful revenue source of the World's Fair. Thirty six enclosed passenger cars were hung between two 250 foot wheels. The size of streetcars -- 27 foot long, 13 foot wide and 9 foot high -- with large observation windows barred by iron safety gratings. Each car was fitted with 40 swivel chairs and had room for twenty more standing passengers for a total of 60 passengers. 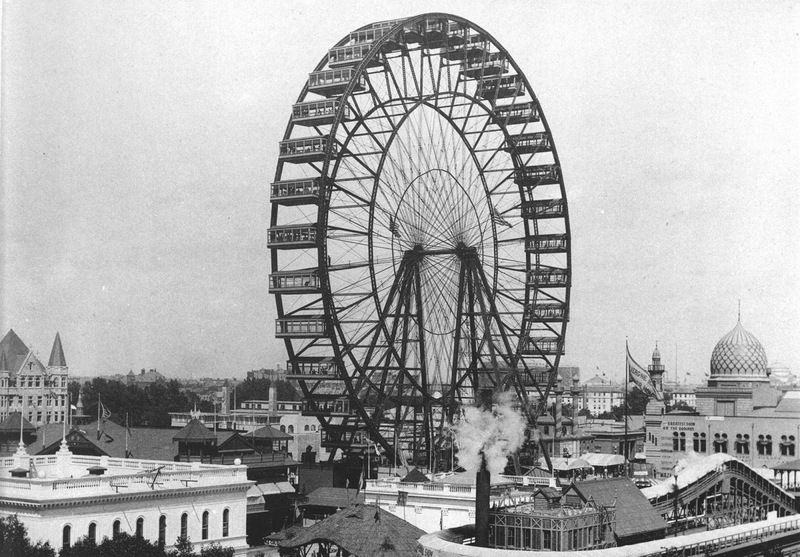 The Ferris Wheel at the 1893 World's Columbian Exposition. The wheel rotated on a 71 ton, 45 1/2 foot axle comprising what was, at that time, was the world's largest 'hollow forged' axle weighing 89,320 pounds, together with two 16-foot-diameter cast-iron spiders, for the spokes, weighing in at 53,031 pounds. Each car weighed 13 tons. Stepped platforms at the base of the Wheel enabled six cars to be loaded and unloaded at a time. Fully loaded, the Wheel's maximum capacity was an astounding 2160 passengers. Each car also carried an employee (totalling 2196 people) to keep an eye on the passengers health and well being. The Ferris wheel took 20 minutes to make two revolutions (your ride), the first involving six stops to allow passengers to exit and enter and the second a nine-minute non-stop rotation, for which the ticket holder paid 50 cents... the same cost as the Fair's entrance fee. It was instantly hailed as the "eighth wonder of the world." With skyscrapers in their infancy, the 264 foot tall Ferris wheel stood just a bit shorter than the tallest building in North America at that time, Chicago's Masonic Temple. Outlined at night by 1400 light bulbs, the Wheel reportedly could be seen from 50 miles away. INTERESTED IN WHERE THE FERRIS WHEEL WENT NEXT? The Original Ferris Wheel at Ferris Wheel Park. Read my book for an in-depth look at the Midway Plaisance at the 1893 World's Columbian Exposition in Chicago. The History of Carmi, Illinois. The Great Conflagration of 1857, Chicago. The Evolution of Streets in Chicago. Downtown Chicago's Cow Path from 1844. History of Chicago's Public Bath Houses. The East St. Louis, Illinois Race Riots of 1917. Waste Disposal History of Chicago, Illinois. The Story of the "American Bottom" in Illinois. The Chicago Fire of 1894. The Chicago Fire of 1874. The 1948-49 Chicago Railroad Fair. Lost Towns of Illinois - Sangamo Town, Illinois. Where did you say Route 66 started? The Mount Prospect Creamery Company.